DERMA E didn’t start out in the beauty aisle or the board room. Instead, we started out in a local health food store in Southern California. Our first product was a jar of 12,000 I.U. Vitamin E Moisturizing Crème. People were amazed at the results it had on their skin, and word caught on. Over the years, we’ve introduced many extraordinary products, each one rooted in our belief that skin health can be visibly improved through the right combination of potent vitamins, wholesome nutrients and good, clean hydration. Today, we’ve grown to become one of the largest natural facial care brands in the US. We attribute our success to honoring our customers with products that promote healthier looking skin and business ethics that promote a healthier world. Wash away dirt, oil, and impurities for a fresh, healthy complexion with this naturally exfoliating formula. Vitamin A, commonly referred to as the "skin vitamin", is best known for its cellular renewal properties. Glycolic Acid, Marine Plant Extracts and Papaya thoroughly clean skin and encourage mild exfoliation. 100% vegan, cruelty-free, paraben-free, sulfate-free, mineral oil-free, lanolin-free, gluten free, GMO-free. DERMA E collaborated with clean beauty and lifestyle mega influencer SunKissAlba to create a must-have product that combined her favorite oils. Formulated with skin-loving antioxidants to help nourish and deeply moisturize skin. deeply moisturizing oil that may help promote healthy cell renewal. contains antioxidants and vitamins that may help the appearance of healthy collagen. helps to provide antioxidant-rich moisture for healthy tone and renewed texture. natural mineral to help enhance skins healthy, natural glow. This amazing product locks in essential hydration for healthy ton, renewed texture and promotes skins natural radiance. This essential oil is multi-functional and perfect for reconditioning your face, body and hair. Get beautiful skin with DERMA E this Valentine's Day and beyond! DERMA E has become one of my favorite skincare brands because their products always produce amazing results. I also love that their products are natural and oh so good for my skin! 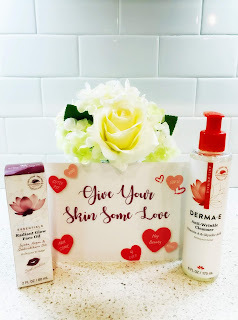 Valentine's Day will be here soon so now is the time to start prepping your skin, and I can't imagine a better way to do so than with these two amazing products! DERMA E's Anti-Wrinkle Cleanser is my favorite cleanser right now! It removes every trace of makeup, dirt and excess oil with ease. I also love that it removes my eye makeup easily without irritating my eyes. It contains vitamin A to encourage cellular renewal, and glycolic acid, marine plant extracts and papaya to help thoroughly clean skin and encourage mild exfoliation. It's the perfect way to get glowing, healthy skin! 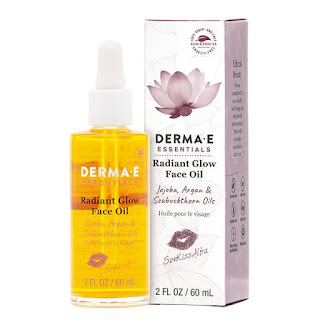 Radiant Glow Face Oil by SunKissAlba from DERMA E is a must have! It's formulated with skin-loving antioxidants to help nourish and deeply moisturize skin. It quickly hydrates my skin and leaves behind a radiant glow to love. I also love that it's multi-functional and perfect for using on your face, body and hair. DERMA E has just what you need to get beautiful this Valentine's Day and beyond! Click HERE to find a store near you that sells DERMA E! Click HERE to learn more about DERMA E! Follow DERMA E on social media! Favorites from Nu Skin to Fall in Love with! Have Some Fun with NCircle! + Giveaway! Perfect Your Skincare Routine with KORRES! Get Gorgeous with Elizabeth Arden! Look Your Best with Maybelline New York!